Men only. Check- in 8:30pm. Check-out 7:45am. Meals provided at The CROSS for dinner at 7:00pm. Check-in 8:30 pm. Check-out 7:45am. Women can meet at The CROSS for dinner at 7:00pm. Transportation will be provided to Gateway at 8:30pm and then back to Seaford in the morning. The CROSS building is located at 703 East King Street, Seaford, DE 19973. Men only. Check-in 7:00pm. Check-out 7:00am. 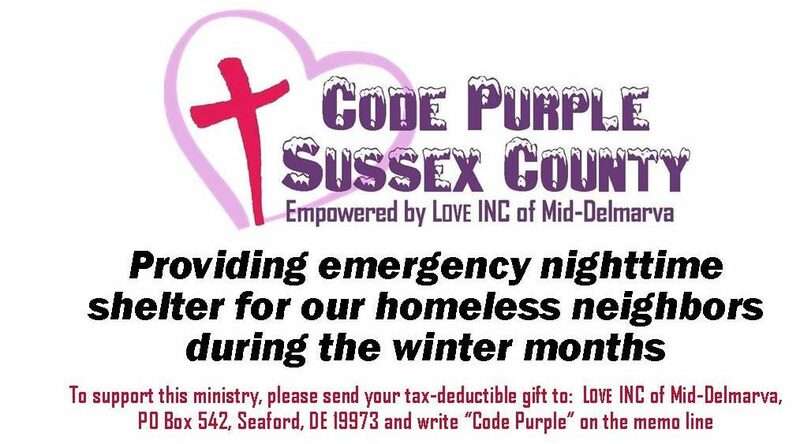 Any further questions can be emailed to codepurplesussexcounty@gmail.com or call the hotline at 302-519-0024. Previous PostShelters opening tonight! 11/12/17Next PostShelters opening on Wednesday, November 22, 2017 & Thursday, November 23, 2017 (Thanksgiving night)!! Thanksgiving meal will be served for our guests! End of the Season Updates!